"On today's date, we held an award exercise for officers of the month. These officers were awarded from January through to June 2011. 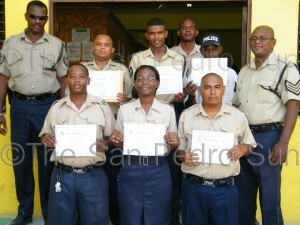 The officers were awarded for their overall performance, their attitude towards the job and their general temperament". Awards were issued to officers as follows: January - Special Constable Albert Lawrence; February - Police Constable Randy Lyons; March - Woman Police Constable Kendra Thomas; April - Corporal Hernandez; May - Police Constable Ramirez; and for the month of June 2011, Police Constable Trap was awarded for his outstanding service. According to Sergeant Reyes, the San Pedro Police Formation was able to secure gift certificates from the business community that served as their awards. The exercise is done with the intent to foster continued production amongst the personnel and motivate them in their day to day execution of their service. It is the hope of the department that the presentation of awards will serve to encourage commendable performances from the personnel and serve as a motivational mechanism for others to accomplish similar tasks. "Well, I feel very motivated. And I proudly accept the award from the SPPD and from the recognition of the community. We all have one objective. To protect peoples' lives and property and to preserve law and order so with that said, I take this opportunity to encourage other officers to embark on that road that would give us a very successful job. I would like to say thanks to the community and once more to the SPPD for recognizing the contribution that I gave". "It can not be done without your support".